Matchmaking is an Irish tradition that’s as old as time. It began in Lisdoonvarna when visiting gentry came to ‘take the waters’ at this spa town and looked to match their children with someone suitable from the upper classes. Parents would bring their children together at social gatherings, sporting events and musical evenings – and all being well, courtships would blossom. The opening of the West Clare Railway in 1887 meant Lisdoonvarna increased in popularity as a tourist destination and the matchmaking tradition grew. With the harvest safely in and September being the peak holiday month, many bachelor farmers began to flock to Lisdoonvarna for a spa town vacation – and in search of a wife. – Live music and dancing with the performances by the very best names in traditional country music. 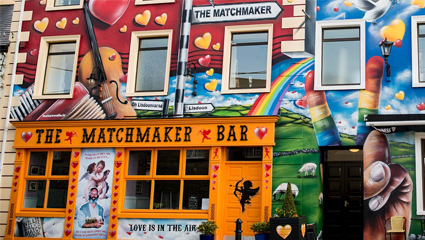 – Daily matchmaking with Matchmaker Willie Daly in his ‘office’ in the Matchmaker Bar. So let’s have some fun and find your match there!! !